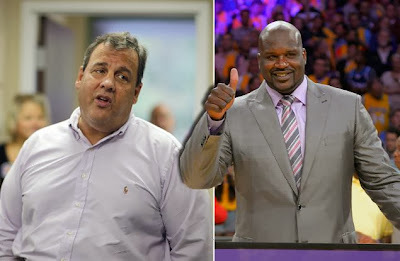 New Jersey Governor Chris Christie (R) nabbed the endorsement of a former basketball superstar on Sunday. Shaquille O'Neal, a Newark, N.J. native, appeared in an ad in support of the Republican gubernatorial candidate's reelection, saying, "I don't endorse many politicians, but Chris Christie is different." The former athlete touted Christie's commitment to education and job expansion in the ad, which was released just over a week before the Nov. 5 election. "He's a good man," O'Neal said in the ad. "Excuse me, he's a great man." O'Neal has worked with Christie on several statewide initiatives in New Jersey. In March, he met with Christie to discuss the state's gun buyback program. And just this month, the duo announced an after-school program to prevent New Jersey students from getting involved in drugs and crime.